Recently refurbished No 2 The Mariners provides cosy, comfortable accommodation sleeping up to 6 people in 3 ensuite bedrooms (2 dbl/ 1 twin). Small, enclosed courtyard at the rear. Parking space. 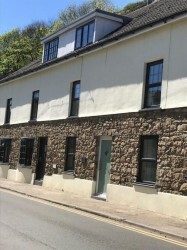 Its location on Main Street puts it right in the middle of all that Solva has to offer. For more details/pictures please email Gill.